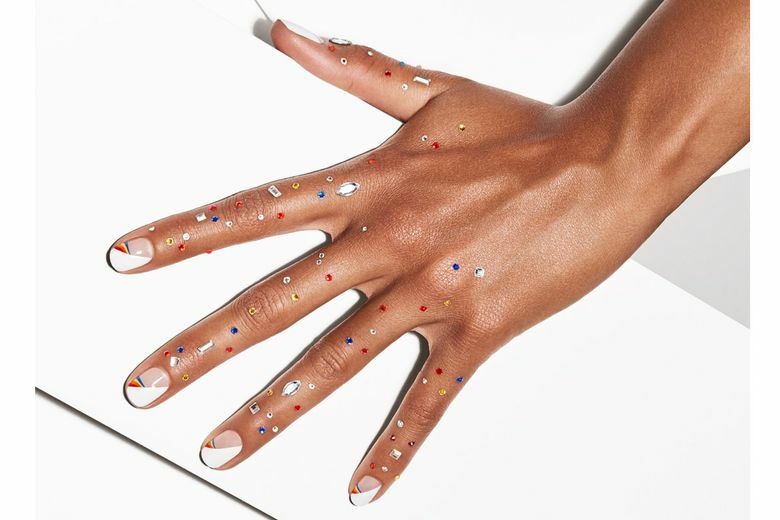 Extending nail art onto your hands adds a lot glamour without a lot of commitment. “This is a ’90s reboot,” Miss Pop says. “It’s an evolution of that excessive aesthetic we’re seeing all over fashion and beauty.” And as anyone who has ever bedazzled a denim jacket knows, rhinestones create big visual impact but are surprisingly easy to wield. 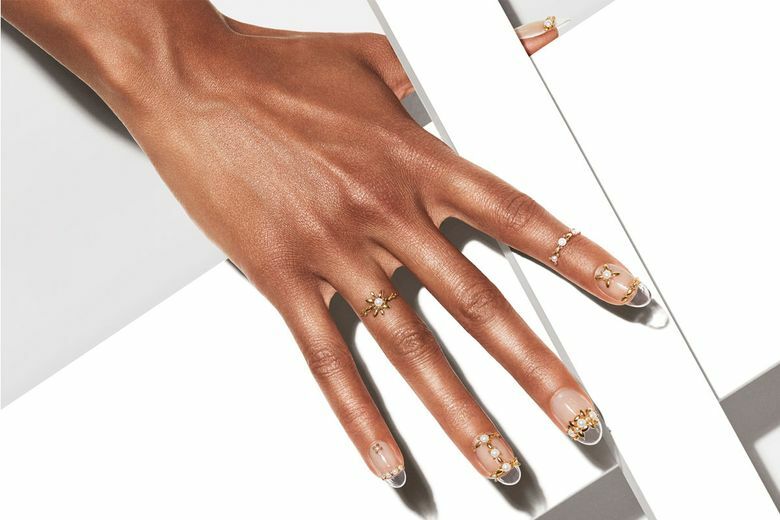 Summer with its nonstop events — weddings, beach days, outdoor festivals — is the best season to introduce the nail-art-is-hand-art look. According to Miss Pop, this cheerful crystal design is an evolution of the bejeweled makeup and hairstyles seen recently on celebrities. She says she loves the jewels that Janelle Monáe has been wearing in her hair, done by her hairstylist Nikki Nelms. To re-create this scattered pattern (see image, cover), mix about four crystal colors. Miss Pop used both baguettes and round shapes, which you can find at a bead and trim store or order online. On the nails, Miss Pop used a thin striper brush to paint each color of the rainbow and filled in the other half of the nail with white polish. The horizontal colored lines are the most difficult part of this manicure. “If the stripes are too hard, there’s no reason you can’t do some version of it, painting each nail a different color or applying color on just the tips of the nails,” she says. The Double Rainbow nail look. If you can use a felt-tipped liquid eyeliner, you can do this hand art, Miss Pop says. The main idea here is to repeat the shape on the nail on the hand. To get an even rectangle cutout, use a striper brush to paint a thick horizontal line a third down the nail. Divide that line into thirds, with two vertical lines that end at the tip. 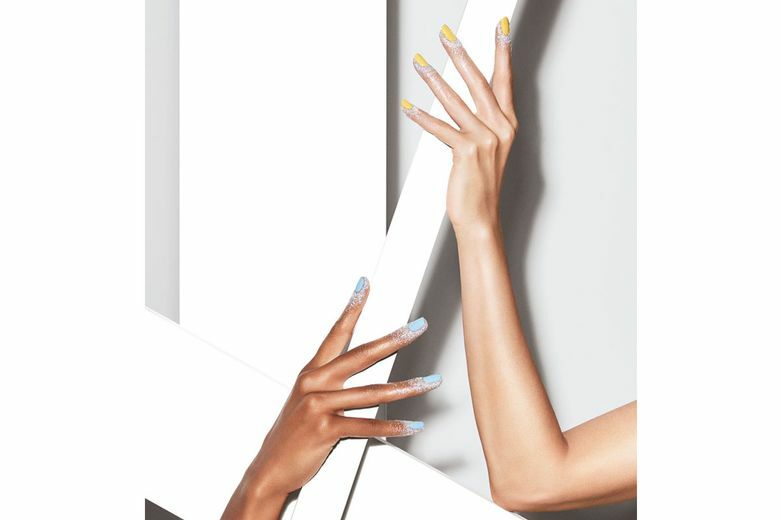 Cross those two vertical lines with a second horizontal line slightly above the tip of the nail. Polish around the rectangle created at the center. With a liquid eyeliner pen, like Stila Stay All Day Waterproof Liquid Eyeliner ($22 at Ulta), draw a rectangle starting at the cuticle. “The waterproof liner will survive several hand washes,” Miss Pop says. “It looks like it would come right off, but it isn’t going anywhere unless you really want it to,” Miss Pop says. This very fine glitter sets durably with spirit gum adhesive. Paint your nails first. Miss Pop paired baby blue and soft yellow with holographic silver glitter. Brush a thin layer of spirit gum all around the finger.Then, using a flat brush, press the glitter onto the glue. To get the ombré effect, add a second layer of glitter tighter around the cuticle and fingertip. For this ornate design, Miss Pop applied each bead individually, which she acknowledges is a time-consuming and delicate task, particularly for a nail-art novice. The best DIY option is to buy beads in ready-made clusters, then create a design with those. Plan your pattern on paper before placing the beads on your nails or hands. For the nails, use a combination base and topcoat specifically designed for rhinestones and beads, like China Glaze for Rhinestones Only Base Coat/Top Coat ($7 at Ulta). Place the beads right into the base coat. If you make a mistake in placement, the beads move around easily in the polish. Brush over the design with the same clear polish. On the hands, apply the beads with eyelash glue. To get the design creativity flowing, Miss Pop suggests looking to jewelry designs for inspiration.